The defence of human rights has been a cornerstone of inclusive and open societies over the past decades. Despite the perpetuation of violations in many countries and the continuing debate over what is and isn’t a human right – for the past 70 years our civic, political, social, economic and cultural freedoms have been strenuously protected and promoted . Multiple sources from within and without the human rights movement have pointed to a deteriorating rule of law over the past 10 years, and a declining respect for basic civil and political rights. They warn of a new era of controlled freedom that is likely to undermine stability in the countries in question. The space for civic freedoms is being gradually restricted. So what does this restriction look like? Methods range from the suppression of mass protest and silencing of individual protesters to technological intrusions and burdensome regulatory measures. The organization Front Line Defenders has 301 active cases of defenders-at-risk , cases that include threats and intimidation, physical attacks, judicial harassment and travel bans. The ability of human rights defenders to do their work is being gradually constrained – sometimes in subtle ways, such as via laws that make it risky to engage in civic activity. Legal experts from the International Centre for Non-Profit Law estimate that, between the beginning of 2015 and September 2016, 64 laws were adopted that attempted to prevent civil-society organizations from registering, protesting or receiving international financial support. Furthermore, in the current context of heightened security concerns and terrorist threats, governments have promulgated security measures and new regulatory frameworks, and these have put everyone under greater scrutiny. The trade-off between keeping people safe and protecting their freedoms, however, has not always been managed in a balanced way, with evidence showing the disproportionate impact of some of these measures on civil-society organizations in certain parts of the world. 1. It is not just about the usual suspects. Civic freedoms are being progressively restricted all over the world. 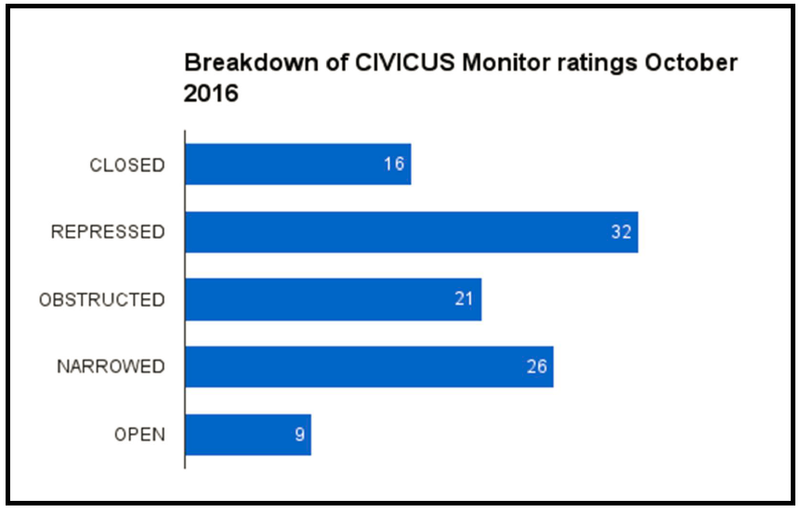 Data from the CIVICUS Monitor tells us that 3.2 billion people live in countries where the freedoms of expression, association and peaceful assembly are repressed or non-existent, with only nine countries rated as open in terms of enjoyment of rights and adherence to rule of law. In the 2015-16 period alone, Amnesty International documented a severe assault on people’s basic freedoms, with more than 122 states ill-treating people, more than 30 illegally forcing refugees to return to countries where they would be in danger and 19 others committing war crimes or other violations of the “laws of war”. The trend encompasses countries that have traditionally been appreciative of inclusive societies and where now there is more sensitivity and cautiousness towards human rights work. 2. The restrictions affect more than advocacy groups. The unprecedented attack on rights has been visibly targeting civil-society organizations, particularly those who are working in the governance, human rights and transparency domain. However, restrictions are also affecting the ability of engaged citizens and activists – particularly those daring to challenge economic and political elites, and to voice their concerns and exert their rights, especially freedom of association, assembly and expression. The operational context of academia , philanthropic and other development and humanitarian entities is also scrutinized and constrained in specific geographies. 3. Technology is a double-edged sword . On one hand, the digital domain has expanded the human rights space by offering citizens virtual platforms for engagement, expression and mobilization on issues they care about. On the other hand, technological tools are being used to increase control and surveillance on citizens, restricting their digital rights – and by consequence the digitally enabled array of civil, political and economic rights – as well as limiting the sense of empowerment warranted by new technologies. 4. It’s taking an enormous toll on society . Civil society is a critical player for the social, economic and political health of a nation, and serves a multitude of important functions and roles, meaningfully contributing to more inclusive, transparent, equal and sustainable societies. Closing the space for human rights and connected civil-society activities not only reduces the number of actors and operations that are protecting and promoting the common good in society, but it also potentially increases the likelihood and impact of the risks connected to a shrinking civic space, including diminished trust in institutions, a rise in social unrest and enhanced socio-political and economic instability. 5. It is not too late. In these turbulent times, rays of hope are on the horizon. Human rights defenders have been pushing back, turning to international solidarity for raising awareness of the issue and to innovative solutions and alliances for defending the space for civic freedoms, including the establishment of regional civil-society innovation centres . Businesses have also started playing a role, with human rights defenders having increasingly called on to them to support the promotion and protection of human rights. There are many interesting examples of businesses publicly raising their voices against attempts to limit civil-society activities, as well as creating partnerships with civil society on issues such as internet freedom and privacy . In short, the time is now to speak up and defend the basic human rights that past generations have vigorously fought for. If you are among the fortunate people in the world who can freely exert your rights, take the time to appreciate and defend your privilege. These are your rights: hold them tight. The World Economic Forum's Global Risk Report 2017 will be published on 16 January. Click here to read this year's edition.